For those who want something a little brighter than the recent Blackout release, Adidas has released an extremely clean Whiteout version of the adiPure 11Pro. Of course, since it is a Whiteout, that clean look might not stay around for too long! These look like someone picked up a pair and simply dipped them in a can of white paint and let them dry. The only part of the boot that adds some contrast is the black durability strip that runs along the center of the boot. The Adidas logo located on both the heel and soleplate are also painted black – just a little reminder so you don’t forget which brand you are wearing! There has been a controversial theme surrounding this range since its release, primarily because of the inclusion of a Taurus leather upper instead of the traditional K-leather. Ultimately, it is a case of moving with the times and accepting change, as I had to do while testing the adiPure 11Pro and resulting in a 4/5 star rating. Flex zones in the soleplate and miCoach Technology give it a little extra oomph! I’m definitely not opposed to White releases and actually think these look extremely sharp, but if you plan to play in wet, muddy conditions do yourself a favor and bypass this colorway! 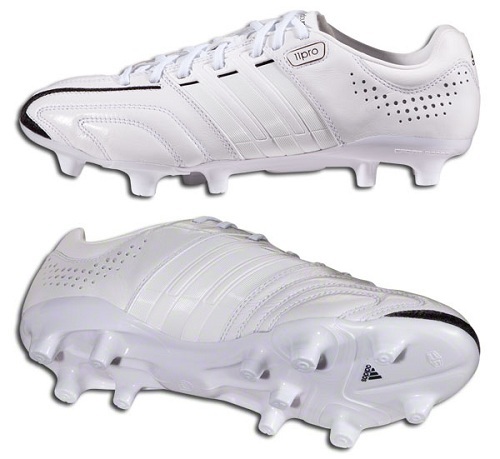 The Whiteout version is a Eurosport exclusive release and is priced at $149.99. See more images of the new release below. 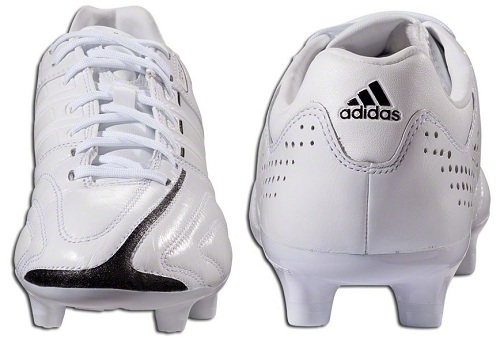 A synthetic Taurus leather is used on the front, with a synthetic saddle employed through the 3 stripes on the midfoot for added support. We are familiar with seeing K-leather used on the adiPure series, but with the recent upgrades to their Taurus calf-skin upper, Adidas has changed its direction. I have pointed out on several occasions that Taurus leather has a downfall; durability. Well, Adidas has actually addressed that area and added an ultra thin layer of protection, called Duracoat, to areas of high abrasion. Well played Adidas! On this version of the SprintFrame, you get a new Flexzone (improves flexibility and enhances lateral movement) and PlusFlex (outsole is split below the toes for higher energy efficiency through movements), with miCoach performance tracking technology also included. Conical studs – goodbye blades. This could be one of the shock features of the boot. Adidas has re-engineered its traction by introducing dual cushioning conical studs that feature internal anti-shock tubes. They are designed to be more abrasion resistant, while improving surface penetration – improving traction and speed. Trimmed down to an ultra competitive 8.2oz. The adiPure IV weighed in at 9.8oz.